In TSOTA’s first piece from Liverpool, Alex Duffy takes us on a tour of the best places to visit in the city’s centre. Voted “Capital of Culture” in 2008, Liverpool is an ideal city for anyone seeking vibrancy and activity. Whether you’re studying at one of its many institutions, on a short trip, or even living in the area already, there’s plenty to do. The city centre alone is full to the brim with places to visit, and its convenient location (especially for students and tourists) makes it the ideal part of Liverpool to devote plenty of time to. With hundreds of places to visit, here are just a few of the top locations to visit. Those outside of Liverpool will likely be aware of the city’s connection to The Beatles. Those within Liverpool will know just how many tourists visit for this very reason. If you adore John, Paul, George and Ringo, you’ll be willing to see as many related sights as possible, so why not make The Cavern Club one of your stops? Located on Mathew Street, the iconic club is a natural love letter not just to one of Liverpool’s biggest exports, but to other legends including Cilla Black and Gerry & The Pacemakers. With the walls lined with memorabilia and nostalgic photos, as well a constant onslaught of talented acts performing on its stage and a friendly drinking environment, The Cavern Club has always been (and still remains) a welcome addition to Liverpool’s music scene. Liverpool isn’t known just for The Beatles though – it’s also a historical port city. 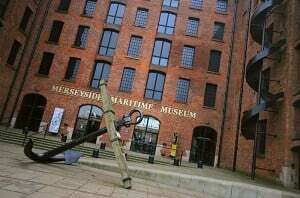 Whether you’re here as an enthusiast or simply interested in learning something new, the Albert Dock’s Merseyside Maritime Museum is here to fill you in. Liverpool’s port links run deep in its past, and the museum pays respect to this to an incredibly fine detail. Exhibits such as “Seized! The Border & Customs Uncovered” and “Titanic and Liverpool: The Untold Story” are both fascinating and enlightening, and events such as “Spot the Smugglers” add a bit of fun to the mix. With a dining room, a café, a souvenir store and a play area for young children, it’s a great place to go on a day out. The city’s music and art scenes are also worth exploring, and one of your best stops will no doubt be on Hope Street in the form of the grand and luxurious Liverpool Philharmonic Hall. It may be a Grade II listed building, yet it is more than just a glorious structure. It’s a hub for the most engaging and well-trained of performances, catering especially to classical music enthusiasts wishing to witness a constant line-up of astounding musicians or even those wishing to join a relaxed learning session to appreciate the genre more. Those looking for something a bit different aren’t left out. The venue hosts a share of contemporary artists, including Caro Emerald, Daniel O’Donnell and Rebecca Ferguson, while shows from comedians such as Bill Bailey, Ken Dodd and Trevor Noah are also on offer. Add to this the numerous films on show (including special airings assisted by a live orchestra) and you can ensure that the Philharmonic Hall is for more than just the classical crowd. Unlike the Philharmonic, FACT is not as immediately visible. Situated between Bold Street and Fleet Street, you’d be forgiven for not stumbling upon it. Despite this, everything about it exudes more than enough style and class to rival its more discernible contemporaries. Simply walking into the foyer, a pristine white masterpiece in itself, presents an idea of the quality of the work inside. FACT’s line-up of films is satisfying, ranging from the entertaining to the educating, the big hits to the cult classics, and the relevant to the revered. Its exhibitions, regularly delving into the ins and outs of the human experience, are unmissable. The FACTLab workshops are just as enlightening, serving as a fantastic aid to anyone hoping to develop their skills. Simply put, FACT is mind-blowing and mind opening. Those with an inquisitive mind may also find Liverpool’s Central library exciting. A haven for enthusiastic readers, every floor is filled to the brim with books, articles and other materials bound to satisfy. Students especially can benefit from this place, especially if their own institution’s library doesn’t stock what they need. It’s a great place for anyone to visit though – with its own café, roof terrace, gaming and PC areas, and meeting rooms, it’s a great place to relax with a nice book for a few hours of downtime. From one grand locale to another – at 629 feet long and 331 feet tall, Liverpool’s Anglican Cathedral (located just off Upper Duke Street) is not only iconic, but also visually impressive. Inside, you’ll find equally spectacular sights, including beautiful stained glass windows and a commanding yet soothing organ, the largest of its kind in the UK! It’s not all style over substance though, as daily events of prayer and worship, as well as the Twilight Tours during March to October, ensure that the cathedral’s functionality is as excellent as its architecture. Liverpool’s other main cathedral, the Metropolitan Cathedral (on Mount Pleasant) is also worth a visit. Equally as stunning yet incredibly modern, the Anglican’s counterpart is another beautiful city centre location. 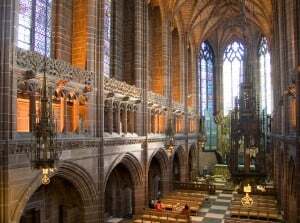 Like the Anglican, it houses it share of religious devotees passionate about sharing their history and message to anyone willing to lend an ear, and it’s enough to warrant a trip to both cathedrals. Since the two are connected by Hope Street (not to mention easy to spot), an outing to both is incredibly convenient. An excursion around the many Liverpool landmarks is wonderful, but if you’re looking for something more relaxed, LEAF on Bold Street is your answer. A tea shop with the vibes of a café, the menu of a restaurant and décor to rival some of the city’s most laid-back bars, it’s a great place to get off your feet for a while or just pop in for a quick drink. Upstairs you’ll find LEAF’s stage, coupled with a classy bar and an equally as relaxed atmosphere as downstairs. It’s a far cry from other concert spaces within the city, yet the talent is just as strong and the laid back ambience is perfect if you prefer to chill out during a performance. For an alternative to LEAF, check out the Arts Club on Seel Street. The bar and kitchen area boasts an American-influenced menu and plenty of drinks on offer, including such exciting cocktails as the rum-based Fashionably Late. No single day is the same, whether you’re attending Sunday’s Stylus (a day including a pop-up vinyl shop and a music quiz) or down for a few drinks on Thursday night, where you can win your drinks for free in a game of Rock, Paper, Scissors. The Arts Club also has its own concert spaces, hosting not just emerging local talents but also big-name acts such as Foals, Foxes, and Martha Reeves & The Vandellas. Unrestricted by musical genre, the venue welcomes acts from a range of different background and the audiences thrilled to watch them on stage. And with 20% off food just before the gig with your ticket, what’s not to love? If you’re more the type to wind down at a bar at the end of the day, try The Font on Arrad Street, opposite the Metropolitan Cathedral. A small bar with a cosy atmosphere and cheap drinks, as well as an expansive cocktail menu and plenty of food on offer, it’s a great place to put your feet up. Make sure you turn up for the bar’s three-hour happy hour from 5pm to 8pm, which includes double spirits and mixer for the price of a single. The entertainment is top-notch too, including FIFA and Mario Kart available to play and a Thursday quiz night, so make yourself at home! Liverpool’s appeal extends to more than these locations alone. The city has plenty on offer, from the well-known locations such as the Empire Theatre to the independent places including the Camp & Furnace (a bar and restaurant located in a warehouse in the Baltic Triangle), there’s plenty to choose from. There’s plenty of places to visit, but the scope of what’s in the city is huge. With so much on offer, make sure you get the most out of any trip to Liverpool!